A gang member who travelled to four different countries while on the run has finally been jailed. 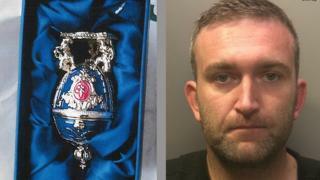 Miles Bishop, 34, broke into homes across south east Wales and stole expensive cars and jewellery, including a Faberge egg and an MBE medal. He had been sentenced in his absence after fleeing his trial at Cardiff Crown Court in 2017. Police brought Bishop back from Malaga to the court on Wednesday under a European Arrest Warrant. Gareth Elliott, Steven Gorry, Geni Dragjoshi and Bishop received sentences in 2017 ranging from one to seven years for offences including conspiracy to commit burglary, conspiracy to steal cars and handling stolen goods. Bishop was sentenced to seven years in jail after being found guilty of conspiracy to commit burglary and conspiracy to steal cars. The gang targeted affluent country areas, including Chepstow, in Monmouthshire, and Peterston-super-Ely, in the Vale of Glamorgan, where they stole cars including Audi TTs and Mercedes convertibles. Det Con Alex Mills, lead officer in the case, said Bishop, from the Malpas area of Newport, initially fled to Turkey but then travelled to Dubai, where he was later jailed in a separate theft case. The National Crime Agency issued an Interpol alert after Bishop fled the UK which flagged where he had travelled to. Gwent Police said they were also alerted to his whereabouts by "concerned members of the public" using social media. Cardiff Crown Court heard British authorities began extradition proceedings but Bishop was ordered to leave Dubai after serving three months in prison. Bishop then flew to Moscow airport where he booked a "private plane" to Heathrow, but did not travel on that flight, the court was told. Instead he flew to Malaga where his passport was flagged with Spanish police. Det Con Mills said Bishop had been in custody in Spain for three weeks and was brought back to Bristol Airport on an Easyjet flight. Appearing in a red T-shirt Bishop, who clearly has a tan, was told he had been sentenced in his absence and now his "sentence will take effect". Gwent Police said his arrest in Spain was the result of "an enormous amount of work" by them, in partnership with international agencies and the public. Bishop appeared before Judge Tracey Lloyd-Clarke accused of breaching his bench warrant and failing to surrender. Judge Lloyd-Clarke adjourned a hearing on those offences to a later date.